Roma está llena de magníficos monumentos antiguos, pero hay aún más joyas históricas a las afueras de la ciudad. Este tour de medio día para grupos pequeños desde Roma visita la ciudad de Tivoli, hogar de dos maravillas catalogadas por la UNESCO: las ruinas del siglo II de la Villa de Adriano (Villa Adriana) y la idílica Villa d'Este, un palacio del siglo XVI y complejo de jardín. El tour incluye recogida en el hotel, entradas y transporte de ida y vuelta. La excelente relación calidad-precio incluye la recogida en el hotel, las entradas y el transporte de ida y vuelta. Después de ser recogido de su hotel en el centro de Roma, conozca a su guía y un pequeño grupo de hasta siete personas a tiempo para una salida a las 9 am. Viajando a bordo de un cómodo monovolumen, emprenda el viaje de alrededor de 30 minutos a Tivoli, admirando el paisaje mientras asciende por las colinas de la región italiana de Lazio. A su llegada, la primera parada es la Villa de Adriano, un gran complejo construido por el emperador Adriano durante el siglo II. Sigue a tu guía por los 300 acres (120 hectáreas) de las ruinas, para admirar destacados lugares como el Teatro Marítimo, la Piazza d'oro, el Palacio Imperial y Canopus, inspirados en las maravillas de Roma, Egipto y Atenas. .
A continuación, disfrute de una visita guiada a Villa d'Este, construida por el cardenal Ippolito II d'Este en el siglo XVI y conocida por su arquitectura renacentista y sus hermosos jardines. Eche un vistazo dentro de las habitaciones del cardenal, admire las vistas desde la terraza de Vialone y pasee por los jardines. De regreso en Roma, su tour termina con la entrega en su hotel. Victoria our guide was very knowledgeable and thorough and was very good about answering our questions. I would recommend the tour and the guide to my friends. We loved Hadrians Villa and Villa dEste, but our tour of maximim 7 people was overbooked for 9. Our tour guide was in the 2nd vehicle, and our driver did not speak English. Our tour guide was too focused on her phone. The tour of Hadrian's Villa was excellent as was the enthusiastic and knowledgeable guide. 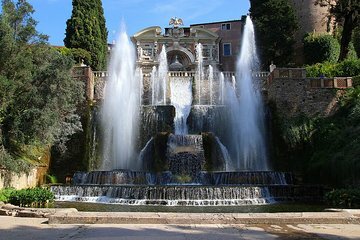 The tour of the Villa d'Este did not take place because the site was closed. We were disappointed. We were given to understand that this was not an unusual event and wonder why we were not given the option of changeing the date in advance rather than being confronted on the day. The guide assured us that a refund would be made. Nothing happened so I had to chase it myself directly with Viator. It refunded what I consider a miserly amount considering that the Villa d'Este was a substantial proportion of the trip. I wonder if they would have refunded anything at all if I had not struggled through their system. Very informative, however when she wasnt providing tour information guide seemed to be on her mobile phone more than was necessary in my opinion. Excellent all around. Great driver and guide. i do wish our guide was more interested in us. Loved the tour and our guide was really interesting. Hadn't realised Hadrains villa was so large and the gardens and fountains were amazing at the Villa d'Este. The only issue was that we had booked for a morning tour and it got changed the day before to an afternoon. This did end up better for us as we missed the worst of the days heat however it was lucky that we had not planned anything for the afternoon.